Southeast Asia: Will Markets and Geography Trump the TPP? Summary: While the Trans-Pacific Partnership should be recognized and applauded for what it will be, it is problematic that the partnership does not include China, the world’s second-largest economy and largest exporter and manufacturer. There hasn’t been much to cheer about in global trade these last few years. The Doha Round of multilateral trade negotiations has been comatose, if not dead. So a recent initiative to deepen trade relations among the countries bordering the Pacific, the Trans-Pacific Partnership (TPP), has been greeted with much applause and welcome relief as a step in the right direction. But while the TPP should be recognized and applauded for what it will be—an agreement providing increased rules-based certainty in trading relations among TPP members—it does not include China, the world’s second-largest economy and largest exporter and manufacturer. For Southeast Asia, that is important. China’s size, location, and dynamism exert an inexorable gravitational pull that has made it Southeast Asia’s largest trading partner. And the TPP will probably not change the fact that, as the last twenty years have shown, markets and geography are the principal factors behind Southeast Asia’s economic integration with China. After all, trade and investment agreements can only facilitate market forces, not fight them. In the end, markets and geography will point Asia toward integrating first and only then will it be in a position to converge with the TPP. Born to modest parents (Singapore, Chile, and New Zealand) in 2002, the TPP has grown to include eleven countries, of which two (Mexico and Canada) were just invited to join at the mid-June G20 meeting in Los Cabos, Mexico.1 Japan and Korea are also considering participation—and if they do join, the TPP countries together would account for 40 percent of global GDP and 28 percent of world trade. The hope is that the TPP will eventually expand to include all members of the Asia-Pacific Economic Cooperation and become the Free Trade Agreement of the Asia Pacific. What makes the TPP unusual is its ambitious scope. It aims to confront barriers to trade and investment that operate at—and behind—national borders, not just by tackling tariff, non-tariff, and technical barriers but also by addressing intellectual property rights, the policy environment for state enterprises, investor-state dispute settlement arrangements, labor rights, and environmental protection, to name a few. The only trade agreement of such scope is the one recently concluded by South Korea and the United States, which, no doubt, serves as an important reference point for the TPP negotiators. The TPP is expected to cover over twenty trade- and investment-related topics. While much progress has been made in some of these areas, virtually all the difficult issues remain unresolved. The thirteenth round of discussions started on July 2 in San Diego, and the general consensus is that the spring of 2013 is the earliest an agreement could be reached—not the end of 2012, the deadline set by TPP leaders. China is conspicuous by its absence in the TPP. True, the TPP’s open architecture allows entry of any country willing to sign up to its high standards, and it is possible that at some point China may do so. But that is unlikely to be soon. China may not be part of the TPP, but it is increasingly central to trade in Asia. The plethora of free trade agreements (FTAs) that China has signed with its neighbors seem to be serving it well (and it is currently negotiating an FTA with Korea and Japan too). China has replaced the United States and the European Union as Southeast Asia’s largest trading partner (see figure below), and the pace of trade integration between China and Southeast Asia shows few signs of slowing. Indeed, trade integration within East Asia at well over 50 percent of GDP is fast approaching the level in the European Union, which is near 60 percent, but unlike Europe, East Asia’s integration has occurred without any formal treaty. East Asian trade integration began well before the recent proliferation of FTAs.2 Markets and geography drove Asia’s trade integration; policies arrived later to support it. The bulk of Asia’s trade expansion has been in intra-industry trade, a reflection of the rising importance of regional production networks in which different stages of the production process are undertaken in different countries. This allows firms to specialize, achieve scale economies, and locate where conditions suit them best. At the same time, geographical proximity helps keep transport and communication costs low. It is no accident that trade with China has grown much faster for mainland—not maritime—Southeast Asia because of the former’s geographical proximity.3 Similarly, despite the absence of a bilateral FTA, India’s trade with China has grown rapidly—so much so that China has now become India’s second-largest trading partner. The TPP will certainly not derail Asia’s intra-regional trade integration for a number of reasons. For one thing, Asia is likely to be the fastest-growing region in the world for the foreseeable future and to increasingly provide the bulk of incremental global demand. This means intra-Asian trade will continue to outpace trade with the rest of the world. Countries in the region have also recently emphasized investments in transport infrastructure connecting Southeast Asian economies with each other and with China. That will further reduce the economic distance between Asian economies, especially in mainland Southeast Asia. Then there are rising real wages and land prices in China and the appreciating real exchange rate of the renminbi. These trends will drive labor-intensive Chinese firms to eventually relocate in labor-abundant Southeast Asian economies, further contributing to integration through trade and investment flows. And finally, given China’s external current account surplus, pressure is building for Chinese firms to increase outward foreign direct investment. Much of that investment is likely to be directed to neighboring Southeast Asian countries. This deepening integration of trade and financial flows will undoubtedly need further policy support. But the answer is not more FTAs. Arguably, the “noodle bowl” of FTAs in the region has become more of a hindrance than a help. Administering myriad bilateral and multilateral rules and regulations adds to administration costs, hinders the efficient transit of goods across borders, and possibly even promotes corruption. Moreover, when constrained by FTAs, governments have resorted to behind-the-border policies to protect industries. For Asia, then, the answer lies not only in fashioning a comprehensive regional trading arrangement that eliminates the need for multiple bilateral and multilateral FTAs but also in ensuring that such an arrangement lowers behind-the-border trade barriers. This will help shape and facilitate the vitality of markets and the power of geography in a vibrant and rapidly growing regional economy. And it will provide the platform for gradual convergence with the parallel evolution of the TPP. 1 Coincidentally, it was also at Los Cabos where Chile, New Zealand, and Singapore launched negotiations for the Pacific Three Closer Economic Partnership (P3-CEP), the forerunner of the TPP. The eleven countries that are currently part of the TPP negotiations are: Australia, Brunei, Canada, Chile, Malaysia, Mexico, New Zealand, Peru, Singapore, United States, and Vietnam. 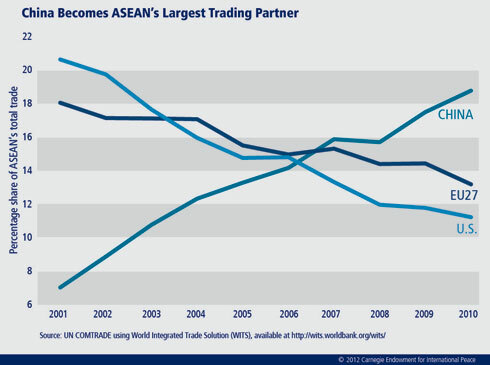 2 Virtually every FTA involving ASEAN came into effect only in the last decade. 3 Mainland Southeast Asia comprises Vietnam, Laos, Cambodia, Malaysia, Thailand, and Myanmar; maritime Southeast Asia includes Indonesia, Philippines, Brunei, and Singapore. The author is grateful to Navtej Dhaliwal for research assistance. It is precisely because of China's anticipated regional success that the TPP alignment has evolved in the direction it has. I wish I shared your positivist viewpoint on the merits of China's economic success, unfortunately unless China capitulates to U.S. free trade rules (which would be very unwise for China''s 1.3 billion population), the U.S. is positioning itself for military action along the sea-lanes to interrupt China's manufacturing position in the global supply chain.. http://statehoodhawaii.org/2012/07/26/tpp-globalization-and-empire/ Personally, I think the global supply chain is leading to excessive depletion of resources and the degradation of the environment, so for the US to shape the TPP towards a policy that will open other Asian economies to replace manufacturing on US free-market terms is short-sighted and only benefits the corporate elite. There are alternatives, but unless the US and China reshape their investment agenda, we will be racing to a new cold war in a much warmer climate.